Although the necessity and importance of exercise support for the elderly people is largely recognized, the lack of skilled and adequate instructors often limits such activities physically. Remote exercise systems can be a solution for this problem because they may be able to support exercise activities even when instructors and participants are in separate locations. 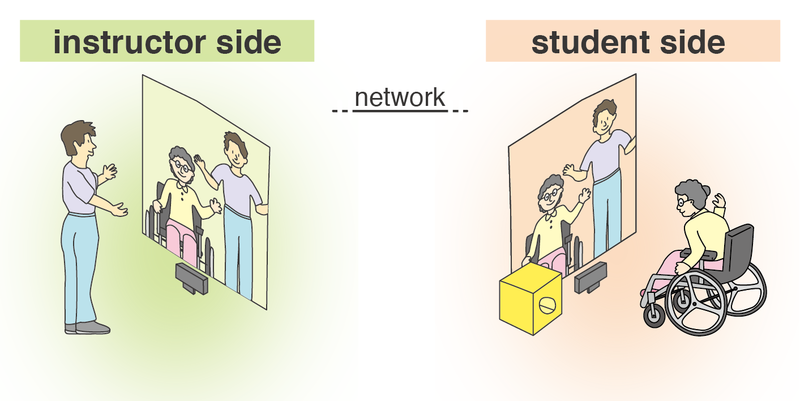 However, when simply using normal video-conferencing systems, instructors and participants have difficulty understanding each side’s situation, particularly during guided physical actions. In addition, remote exercise systems cannot support the adjustment of the position of each user, a task that is quite naturally performed in normal exercise activities. Our system, called CASPER, solves these problems by proposing a mirror-like image composition method in which all the participants and the instructor are shown on the same screen so that both sides can understand the situation clearly. We also introduce an airy haptic device to remotely send tactile feedback for further enhancing sensations. 門村 亜珠沙, 松田 暁, 暦本 純一. 情報処理学会 インタラクション 2016 ベストインタラクティ ブ発表賞. “CASPER: 高齢者のための空気砲 を用いた遠隔エクササイズシステム”. 2016. Azusa Kadomura, Akira Matsuda, Jun Reki- moto. CASPER: A Haptic Enhanced Telep- resence Exercise System for Elderly People. ACM The 7th Augmented Human Interna- tional Conference 2016. AH2016. 2:1-2:8. 2016.